But not all of the law’s effects have been beneficial. Indeed, in response to the law’s mandates, the unsubsidized cost of health insurance has skyrocketed and many basic health insurance plans were cancelled. Insurance companies have sought other ways to control costs, such as narrowing provider networks, meaning some patients no longer have access to the doctors they prefer. A 2016 Gallup survey indicated that while 18 percent of people reported being helped by the ACA, nearly 30 percent said they were hurt. Twenty-four percent said the long-term effect of the law would be a better situation for their family; 73 percent said the effect would make no difference or leave their family worse off. Therefore, it’s no surprise that in 2016 Americans elected a president (Donald Trump) and majorities in the House and Senate who oppose ObamaCare. Republicans say they will repeal the law and replace it with a more market-friendly, patient-centered approach. This change, although difficult, is needed to address the failures of ObamaCare. 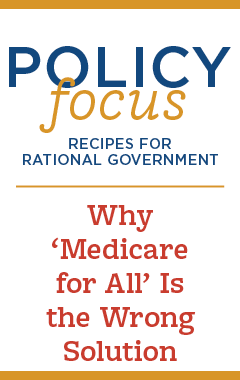 Read on to better understand the reasons why ObamaCare needs to be repealed, and how a more free-market approach to health reform will better address problems in our system.